WorldOfBrights / Stellar Map WorldWide labels mobilize again real enthusiasts of progressive, wishing to invade your hearts with their music! Like "INVADERS" 19 musicians from Russia, Ukraine, Argentina and Brazil will join their creative energy to bring something new in popular commercial sound of national house scene. 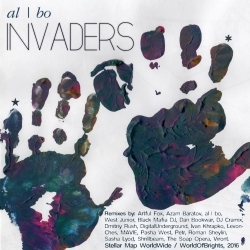 An album of remixes "INVADERS" produced around vocal works of the Moscow synths-pro and vocalist al | bo with participation of remixmakers Artful Fox, Azam Baratov, West Junior, Black Mafia DJ, Dan Bookwar, DJ Cramix, Dmitriy Rush, DigitalUnderground, Ivan Khrapko, Levon-Ches, MAVIE, Pasha West, Petr, Roman Sheylin, Sasha Lyod, Shrillbeam, The Soap Opera and Viront, many of whose works are known to fans of a dance music via series of popular compilations "Map Of Supernovas".